Since this fund was started we have shipped almost 1000+ tarps to the island, 100 chainsaws, and thousands of dollars in immediate relief supplies when we first arrived from food, solar power lanterns, and emergency neccessities. We have worked with teams of people to make this happen, we have not done it alone. It was always meant to me a team effort with a clear goal of helping as many people as possible on the island of St. Barth . We want to thank all of you for all of your help We have come a long way in a very short amount of time but still have a long, long way to go. We still need to purchase and get down to the island an additional 1500 tarps. We need mosquito donuts for another 1500+ pools. We need rodent control, and we need money for airfreight because there are still very few boats going from Saint Maarten because of the situation there. Today we saw our first Red Cross workers, five in total! A little too late in our opinion but we are sure that they too are all stretched very thin . We have 100 chainsaws in San Juan right now that Tradewind are flying over with about the 20 that have come to the island in the last 24 hours. We have tarps coming and logistics seem to be the name of the game. We have been really happy to work with some of the other pop-up legitimate aid groups such as Saint Barth strong, Hurricane Irma relieve Saint Barts, Tradewind aviation and Hurricane Irma/ Terra Mandarin. All of us working together are really making a difference please keep donating to us or any of those mentioned above. Thank you for your continued support you are all making a great difference. 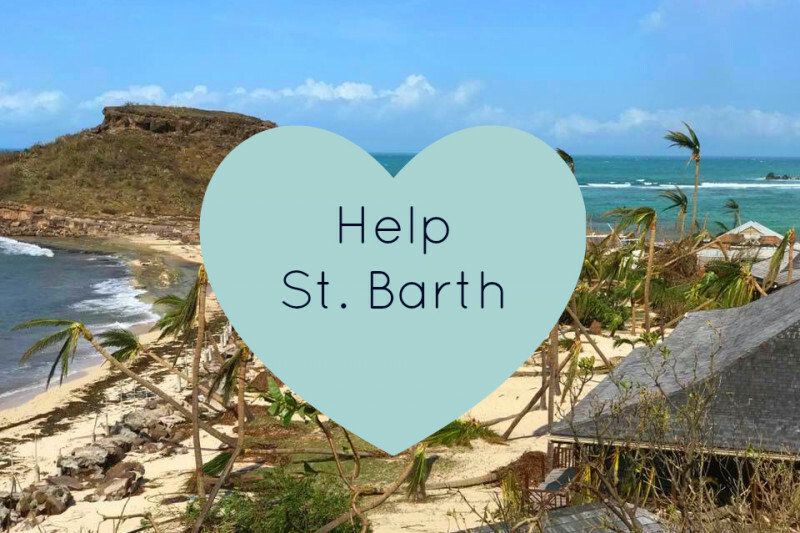 Help St. Barth has been on the ground for over 24 hours now (September 12,2017). The Help St. Barth Gofundme account has assisted with humanitarian needs for many people who are in need. We know much more now that we are on the island, we have met with the local government. Our new goal is to raise enough money to buy 100 chainsaws, some generators, and more humanitarian aid. This morning I gave a woman a package of food and necessities she told me that people need blue tarps because people have holes in their roofs, she knew that eventually she would have help repairing it but in the mean time bugs and fear of rain in what is already a damaged house is a problem. I witnessed people cleaning up the roads, yards, and and lots of other things they had no gloves or if they did have gloves they were borrowed from a friend. The island has lots of bottled water but distribution and man power is an issue, lack of housing as many many homes have blown out windows or just in too much disrepair to be usable, and St. Jean (near the airport). This place is disaster area with limited electricity, water, manpower, and housing that is adequate. This is a fund to assist with the needs of the Huricanne vicitms of St. Barthelemy in the F.W.I. This fund has only been in existence for three days and this morning September 11th the following items are in route and will be delivered in the next 24 hours. We have spoken to many people on the island including a multitude of business owners and residents. We will be coordinating with the local government and prexisitng relief agencies so that we are not donating redundant supplies. People have lost thier homes, many people have lost the contents of thier homes. It is very hard to conjure up that if leave your house one day, when you come back even if your house is there nothing inside is usable anymore, your car has been flipped over, and you have a tree on your roof. Not to mention you are stressed about meeting your families basic needs: food, water, and clean clothing. Even though St. Barth's is a very well off island there are many people on it that are not as fortunate finacially. We will be accounting for all the money at the end of every month, if you give to this fund you will be able to see where your money has been spent. Douglas Foregger and Mai Linh Norton are heading this relief fund to help assist with immediate needs and the recovery efforts to get St. Barth's citizens back on thier feet. We are doing this in conjunction with many island business owners who prefer to remain anonymous. This money will not be wasted every penny will go towards helping rebuild, either the island or someone's life on the island. As stated previously every dollar will be accounted for and the information will be acceible for people who donate to the fund. Thank you for your consideration and generousity. We are 100% for St. Barths. Today things fell together in such a way that made me feel like it was meant to be. Help St. Barth had a large order of tarps that were not needed on the island any more, we spoke with the collectivity they agreed with us. I saw a post of Sea Shepherd Conservation Society about a week ago and I wished that I had a ship to help other islands ... I reached out to them via email and now that shipment of tarps is now going to Dominica at 11:00 tomorrow morning. The MV John Paul DeJoria is now coming to get a our tarps in the Port of Gustavia, then the ship is going to Guadalope to get a huge load of food (from money they raised) then back to Dominica (it's second trip). Soon after we started arranging the pick up Annelisa our friend who is been a very important part of Help St. Barth made the day even better because she found out that the Lions Club and St. Barth Local Red Cross had a large load of supplies that they wanted to get to Dominica .The Lions Club in Dominica requested the supplies for their community. They were trying to get it to the island and it was an issue that is now solved! Distribution lines are set and ready in Dominica to get supplies to people who are hungry and without shelter. St. Barth still needs a help but the entire Island of Dominica is getting some neighborly island love from Help St. Barth, the Lions Club of St. Barth, and The Red Cross of St. Barth. Sometimes it's good to have too much because you can share it with your neighbors in need. Today if you helped share my links or posts, if you donated to Help St. Barth you are amazing! I am so happy we are helping more people in serious need. We are still focused on St. Barth that has not changed. Presently we are organizing to start helping fix homes that were heavily damaged for people that the Collectivity has said is in the most need... in dire need. We are personally walking through homes and assessing the damage with professionals on the island and government officials. These people have no money, no family, and are elderly or handicapped or both. If you would like to "sponsor" one of these homes please reach out to Douglas Foregger or myself as their information is private and will not be posted without their permission. If you are considering giving to Help St. Barth this is what that is left in the fund is getting put towards. As time changes needs change and today this is a need we are trying to meet as best we can with what we have left in the gofundme account. All the chainsaws Help St. Barth bought are all getting put to very good use because not one was in storage today when we checked and I am buying extra chains for them in the US to get them down there. We also bought hundreds of pairs of gloves so that people on the island can clean up the island safely. We are presently working towards attaining NonProfit status so that businesses and people in the U.S. and beyond can give to the Help St. Barth Fund more freely. I have written and rewritten this update a couple of times. I am sorry for the delay things are changing quickly on St. Barth, for the better. I have a lot to learn about the island political environment so I won't talk about things I know very little about. Just about what I have witnessed myself and what we have all accomplished together with the resources we have at hand , in part by our generous donors of this fund. I have seen a community come together, trying hard to physically dig themselves out of their own homes. When I arrived to the island people were buried in debris. Debris made up of broken furniture, appliances, car parts (and upside cars), trees, palms, trash and roofing that was ripped off homes by incredible wind and rain that I hope I never have to experience in my life time. Now that most of the roads are cleared they are moving from clearing the roads to cleaning up homes disposing of the ruined furniture, broken windows, tattered curtains, and heavily damaged roofs... to repairing. Rebuilding their homes, helping repairing their neighbors homes, clearing more trees and more debris from their driveways ... bring load after load of trees to the huge burn pile that makes the island smell like the kind of "Burning man event" you didn't buy a ticket for. It takes a lot of people and an incredible amount of energy make a battered island back into a beautiful paradise as we can all picture in our minds eye. That is what we want this fund to accomplish is to support the people who have the faith and energy to push and make that happen in a short time frame. I have seen men and women literally soaked from head to toe in sweat from working in the heat. The collectivity, the local people, everyone there really wants this season to happen. I believe it will maybe it won't be as glitzy as December 31st, 2016-- or maybe it will be better? I don't know, but I do know that you may not be seeing the entire picture that there are many many people who really are in true need that have left and there home because the roof was ripped off and everything inside is ruined. Their are parents sending there children to France, to Canada, to all over the world to be with other family so that Mom and Dad can rebuild and get the island going again as soon as they can. I have watched it with my own eyes. It is heartbreaking, and this is very real. Good things are happening, everyone is doing whatever than can to all achieve a common goal of rebuilding. I have seen that some rental villas will be ready for rent, which ones I have no idea. Not every single home was destroyed on St. Barth. Many of them need repairs, electricity and water will be restored eventually to everyone, of course but with Hurricane Maria it did set things back a couple of days. For certain areas things are looking good-- other areas that you may not see, are still in a lot of need. The money in this fund will be used to help as many people as possible. Right now the collectivity that we are communicating with as often as we can everyone is getting very organized and we are regrouping over the next couple of days. Hundreds of tarps are on their way to the island coming by ship and by plane. The 100 chainsaws that we bought with this fund are going out for loan and being organized by the collectivity. If you know someone who needs to borrow one please ask them to go to the Collectivity building on the Point and fill out some quick paperwork so that they can use one if they need. Thank you for you support. Please check out "Help St Barth" on Facebook with more photos and updates as to what is going on.